Paperback, 6.5 x 9 in. / 508 pgs / 187 color / 8 bw. Edited by Clémentine Deliss. 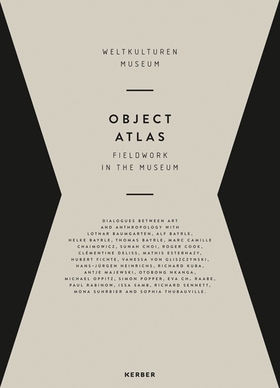 Text by Lothar Baumgarten, Clémentine Deliss, Mathis Esterhazy, Hubert Fichte, Vanessa von Gliszczynski, Hans-Jürgen Heinrichs, Richard Kuba, Michael Oppitz, Eva Raabe, Paul Rabinow, Issa Samb, Richard Sennett, Mona Suhrbier, Sophia Thubauville. 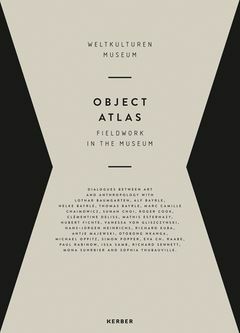 Object Atlas presents objects from the Weltkulturen Museum’s ethnographic collection alongside new works produced by eight artists who lived and worked in the museum’s laboratory during 2011: Alf Bayrle, Helke Bayrle, Thomas Bayrle, Marc Camille Chaimowicz, Sunah Choi, Antje Majewski, Otobong Nkanga, Simon Popper and Hans-Jürgen Heinrichs. FORMAT: Pbk, 6.5 x 9 in. / 508 pgs / 187 color / 8 b&w.